Hello all, it has been quite some time. A lot has changed since late 2014 when I last posted here, I've been to three states and have finally landed in Florida. 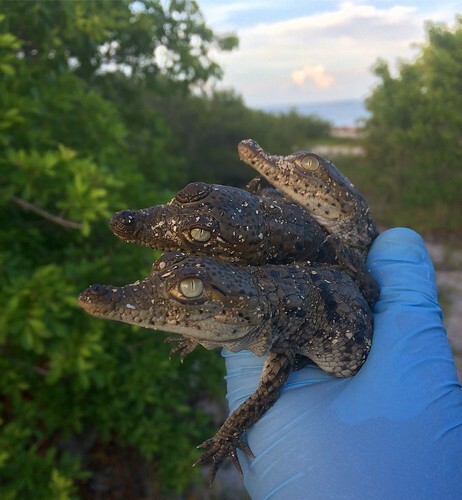 I currently work as a biologist in south Florida, working on a variety of research projects on native species like alligators and crocodiles, as well as invasives like pythons and tegus. I figured it would be fitting to resurrect the blog with a brief trip home to Michigan that I made a few weeks ago. I only had two days to get out and about in some old stomping grounds, so I tried to make the most of it. On Thursday morning, I arose early to beat the heat in an attempt to find a secretive little rattlesnake species that I love. It was warm and humid from some overnight thunderstorms, and the resulting hazy cloud cover made for perfect conditions. 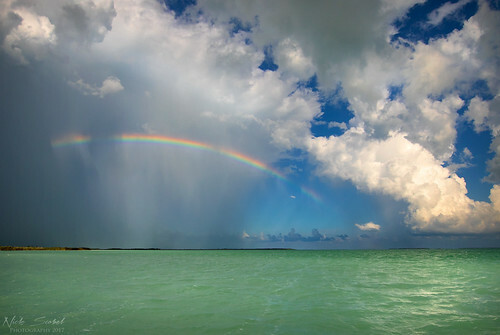 I felt confident as I arrived to my location and was quickly rewarded with this sight. 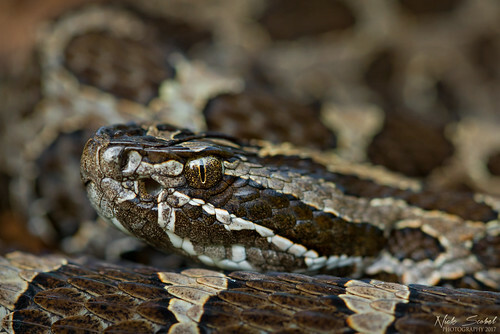 I think these snakes are one of the things I miss most about my home state, they are unique in every way. 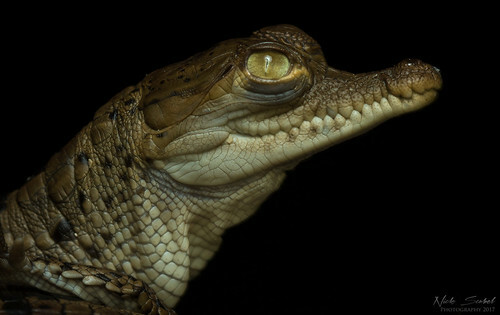 In October of 2016, they were finally listed as a federally Threatened species under the ESA after almost twenty years as a candidate species. The snakes were given protection, but their habitat was not in an effort to keep locations lowkey so that collectors won't poach them. 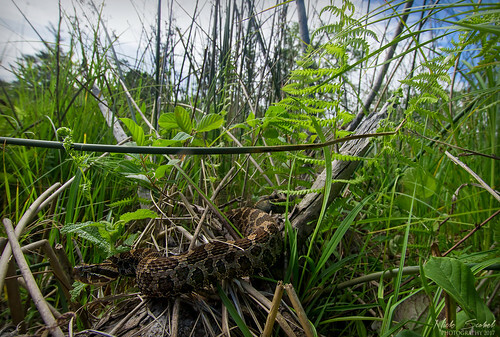 The problem with this, especially in our current political climate, is that intensive surveys are often required to locate secretive species like massasaugas, and a few survey before a site is bulldozed may not reveal any rattlesnakes. 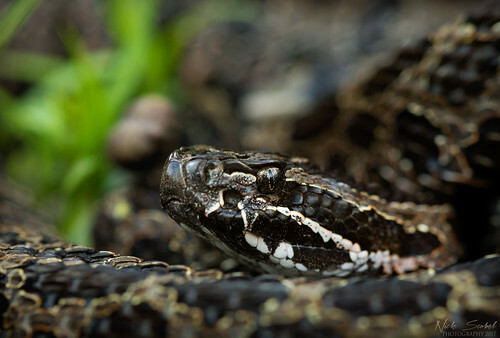 Further measures need to be taken to ensure these snakes continue to get the help they need. What was really special about this encounter was that this a snake I've seen before, first back in 2013 and then again in 2015. The interesting thing is that this snake was using this same deadfall tamarack as a gestation site in those years, and is back again this year and is heavily gravid. As far as I know, site fidelity in massasaugas has been documented in terms of overwintering habitat, but not for gestation sites. 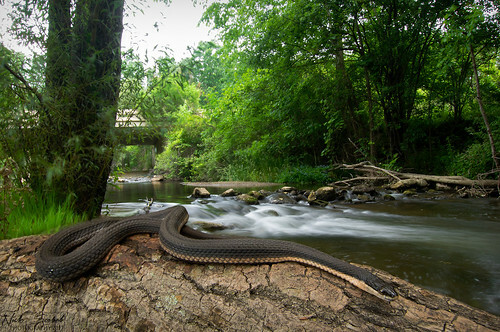 I was able to slowly creep up to the log and capture this in-situ wide angle shot without disturbing the snake, she simply raised her head and tasted the air, but never moved. 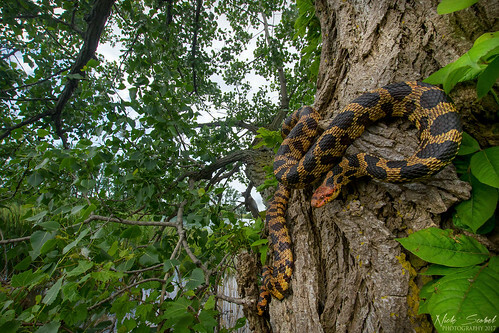 This is why not disturbing gravid female snakes or their habitat is so important, they will often return to use the same sites again and again if they aren't harassed. The conditions got hot quickly, and I had to run into town so I got on my way but kicked up a small massasauga crossing a trail. I didn't have time to stop and photograph it, so I moved on. Later in the day, I drove west to a county that I had looked for massasaugas before, but had struck out. 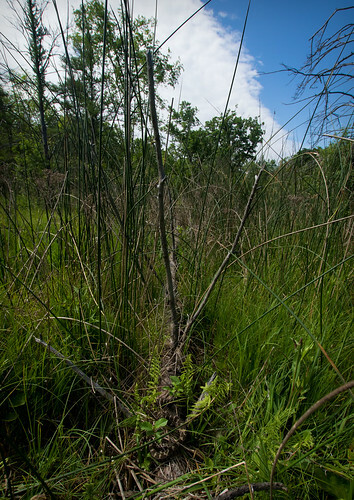 I met up with local herpers Daniel Moniz and Derek Halm to explore a small fen that Daniel had found the year before. Conditions were mostly cloudy and warm, so I liked our chances. 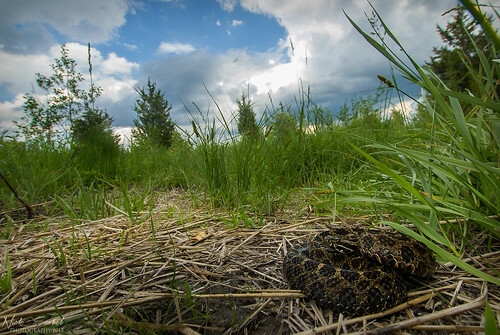 After about an hour of searching, we kicked up this dark gravid female basking right out in the open. This was an exciting find, finding rattlesnakes in new counties is always great. We spent a few minutes taking some photos of the snakes, and then called it a day. 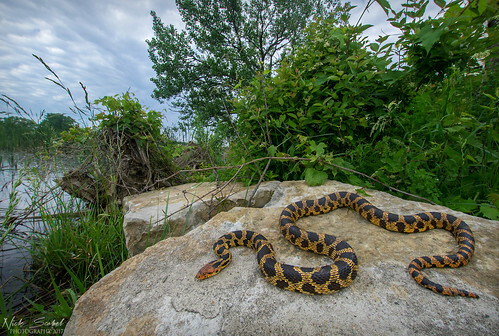 The next morning I arose early once again and made an hour drive to remote southeast Michigan to target one of Michigan's larger snake species, the Eastern Fox Snake. 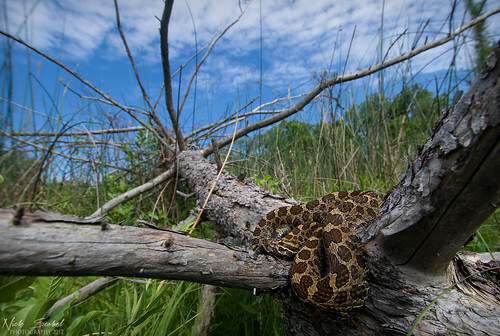 Fox snakes have had a rough go in Michigan, as they inhabit coastal marshes, waterfronts, meadows, and forests, all of which are prime real estate for development. Their numbers continue to decline as more shorefront properties are developed. They can still be found in pockets though, sometimes in good numbers. I arrived at my destination just after nine o'clock and was once again treated to mostly hazy skies with the sun poking through occasionally, perfect conditions for snakes to be basking. I hit paydirt quickly with a large adult, over five feet in length and one of the largest individuals of this species I've seen. A large adult Eastern Fox Snake (Pantherophis gloydi) from southeast Michigan. 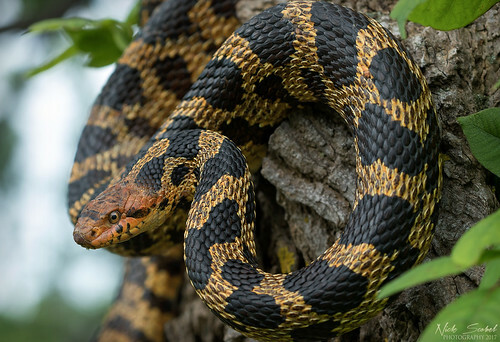 Fox snakes are impressive serpents, their bright coloration and large size make them a treat to encounter in the field. I ended up seeing two more snakes, but only photographed the first one. I decided to move on and meet up with Jason Folt at a site we both had been two several times in hopes of seeing a hognose snake. 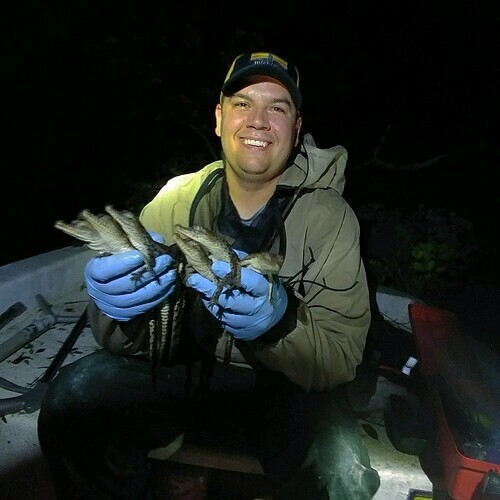 It was warm, but the rain the night before had gotten a lot of toads active on the surface which gave us some hope. 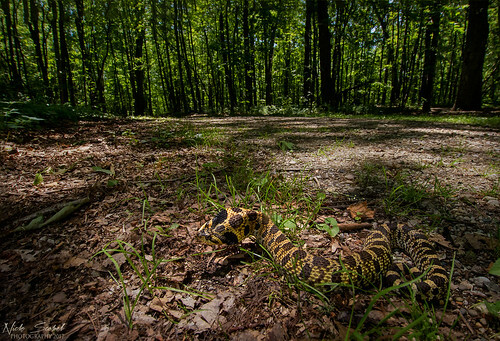 We had been talking about how we often miss snakes in the middle of trails as we usually are looking off to the side when as irony would have it, a beautiful hognose was making its way across the trail with haste. A beautiful adult Eastern Hognose Snake (Heterodon platirhinos) from southeast Michigan. Arguably the best looking hognose I've seen in the field, this snake was a real exciting find. Jason and I had looked for these snakes several times in the past at this location with no luck, so finding one was great. 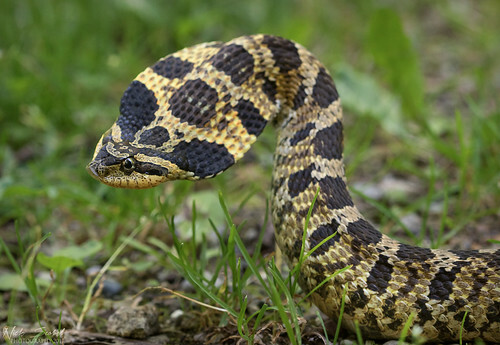 Although hognose snakes are fairly common the the west side of the state, they are uncommon and local in southeast Michigan except in a few pockets where sandy soils still exist without development. We photographed the snake for a few minutes and then parted ways. I had one last stop to make for the day, a small creek in southeast Michigan that people had told me was now extremely difficult to locate queen snakes at. The second rock I flipped revealed two healthy adults, seems as though these herpers need some guidance. An adult Queen Snake (Regina septemvittata) in habitat along a rocky creek in southeast Michigan. These snakes were a pleasant surprise, especially when I had heard news from other herpers that they were now scarce as this spot. Queens are crayfish specialists, only eating freshly molted individuals when they are as soft as a hard boiled egg. Though seemingly uncommon, I think this species is more common than people realize and is likely found throughout much of the lower peninsulas where healthy waterways have large populations of crayfish. The last morning of the trip gave me a few hours to venture out, so I went back to see if the gravid female I had seen was in the same spot. Sure enough, she was basking on the same deadfall in the early morning, just a little higher off the ground than she had been a few days earlier. 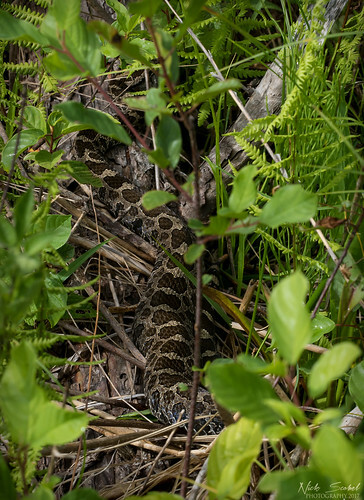 In-situ gravid female Eastern Massasauga Rattlesnake (Sistrurus catenatus) from a mature prairie fen. I took a short video of the snake to talk about the plight and future conservation of the species, it was a great way to close my trip. I was so glad to be able to do as well as I did with the short time I had in Michigan, and always enjoy time spent outside. I'm looking forward to posting more frequently, and will update you on what I've been up to the past few years, and the current work I'm doing in Florida. 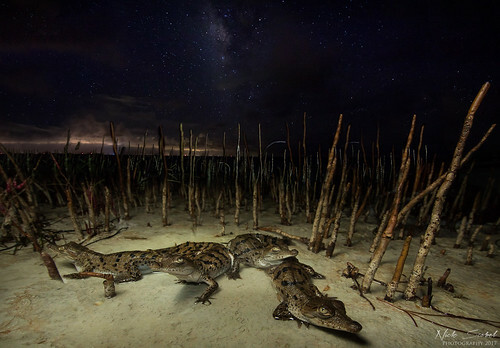 Thanks for reading, and as always, happy herping.